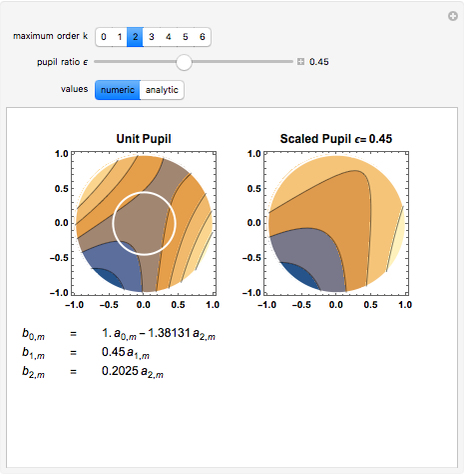 This Demonstration calculates and shows the Zernike coefficients for circular, scaled, centered pupils, having a given pupil ratio, as a function of those coefficients for the unit pupil . The scaled Zernike coefficient expansion can be determined by means of the inner product of the Zernike polynomials and the wavefront error corresponding to the scaled pupil. The relationship exhibited by the radial polynomials and Bessel functions leads to a general expression in terms of the Gauss hypergeometric function. 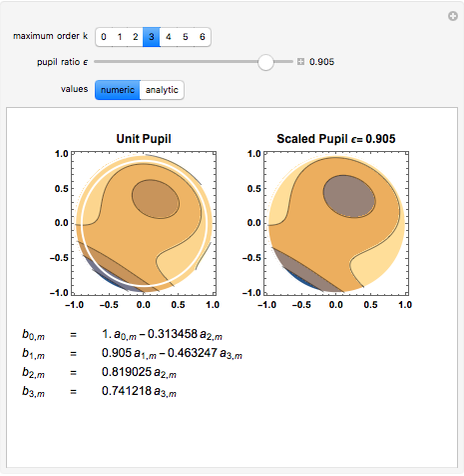 This Demonstration shows how the numeric values (Snapshot 1) as well as the analytic expression (Snapshot 2) for a given pupil ratio can be calculated interactively. 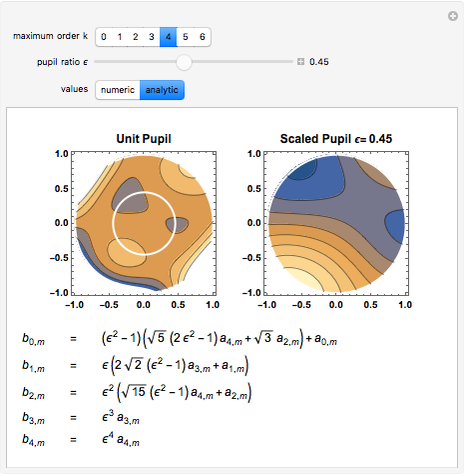 In addition, an example of a wavefront is plotted for a full unit pupil as well as for the scaled one for the different expansion order selected. After work by: J. 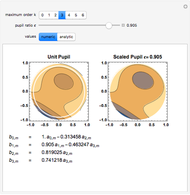 A. Díaz, J. Fernández-Dorado, C. Pizarro, and J. Arasa, "Zernike Coefficients for Concentric, Circular, Scaled Pupils: An Equivalent Expression," Journal of Modern Optics, 56(1), 2009 pp. 149–155. 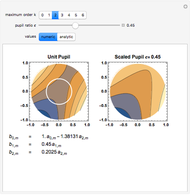 José Antonio Díaz and José Fernández-Dorado "Zernike Coefficients for Concentric, Circular, Scaled Pupils"